After a successful launch of the hotel earlier last spring, Popinjays, The Murray’s rooftop bar and restaurant concept officially launches this season. Perched at the top of the heritage building-turned hotel complex, the bar and restaurant concept is set to present European gastronomy with an energetic, yet glamorous twist. Once used to describe parrots drawn to fly in flocks, the restaurant’s name is a reminder of wild cockatoos that reside in the area, adding a sociable spirit to Popinjays. The restaurant premise has been a popular location for the city’s glamorous happenings including the Hong Kong Tatler x The Artling x Hublot Art Party as well as Generation T Party 2018. 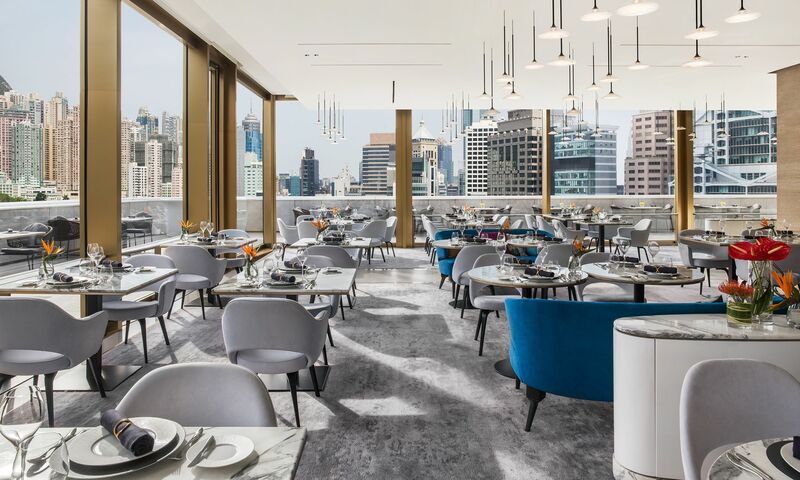 The hotel’s rooftop is transformed into a stylish venue divided into a bar area, main dining space as well as a 420-square-metre outdoor wraparound terrace, capturing a panoramic view of the city from The Peak to Central. Guests can indulge in a wide selection of classic cocktails are bespoke creations, meticulously prepared by resident head mixologist Manuel Saavedra-Ramirez, who creates a new ‘Aviary Collection’ of cocktails inspired by fresh ingredients blended with the mixology team’s artistic touch. Guests can also add exotic flavours for an enriched gin and tonic experience, as well as a selection of revived cocktail classics at Popinjays. The establishment’s new menu offerings are showcased in a four or six-course seasonal degustation menu, available from Monday to Thursday, as well as a unique ‘Birds of a Feather menu’ available on Fridays and Saturdays, with the latter set for sharing among four guests with free flow cocktails. Popinjays are open for early evening drinks and dinner.